Today, because of the growing masses of the disenfranchised and the dissatisfied, the societal structures that have given sanctuary to systemic racism in our nation are beginning to fall down. It is falling down not only under the weight of its own shoddy construction, but it is being aided in its fall by a generation that refuses to take this anymore. So many of us feel so powerless, unable to affect substantive change, unable to do anything other than hurt. Powerless does not mean there isn't work to be done. It is silence, inactivity, complacency and disconnect that are the enemies of justice, not rage. We are asking courageous New York City Council members to exercise their oversight power by passing the Right to Know Act, which would strengthen police accountability and transparency by requiring officers who stop us to identify themselves. The national discourse on black life has shifted since Ferguson, and according to some organizations - so too must the vote. Marc talks voter intimidation, upcoming elections and the power of the ballot with organizations across the country. 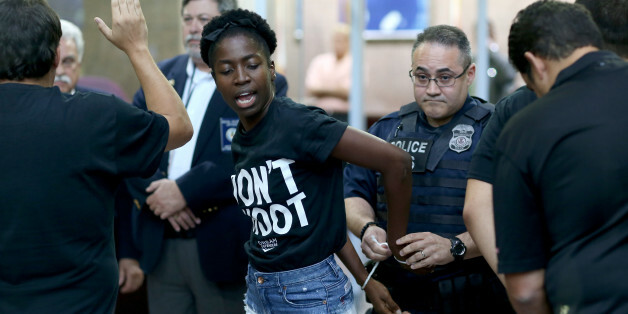 This past weekend, hundreds took to the streets of Ferguson, Missouri in continued protests, forums, and demonstrations seeking justice for Mike Brown and other victims as part of the highly organized Ferguson October weekend of civil disobedience. It may seem crazy that I'm voluntarily choosing to enter a zone where any of these protective preparations are necessary, but as I've spent hours on my couch in Brooklyn watching the coverage of this situation, it just feels like I can and should do something more. Trayvon Martin, Jordan Davis, Renisha McBride, Eric Garner, and Michael Brown will not simply be footnotes in history. They will be the names we look back on as those who united a new generation to sacrifice, endure, and fight for justice and equality and create a new Civil Rights Movement. In 1964, Dr. Martin Luther King, Jr. delivered his acceptance speech for the Nobel Peace Prize. King argued that the "spiritual and moral lag" in modern man was due to what he later referred to as the "triple evils" of society: capitalism, militarism and racism. Matters of fairness, opportunity and inequality were center stage at this last week's State of the Union address. But it was the President's focus on education that brought home how one of our most important public institutions is suffering from the same inequities. My students, most of whom were African American, began to cry. They said, "Professor, they killed Emmett Till, Malcolm X, Dr. King, and those four little girls in Birmingham. They still follow us, harass us, and are still killing us because of our race. Will it ever stop?" I responded, "Only when you make it stop." Have the Darkest Moments Passed? The undervaluing of black lives and race-based hate crimes remain a critical issue. How can a people be truly free if they are dehumanized, and even killed, because of their race, and often without consequence? They're being recognized as the next generation of civil rights leaders. But rewind a month, and almost nobody had heard of them. So who are they, and where did they come from? These are corrosive practices and policies that impact all communities and growing Muslim-American recognition of this fact has been reflected in increased involvement in this civil rights moment.